A toast to you–my readers and especially my subscribers and followers–on this Valentine’s Day! Without you, I’d just be writing to myself–and it is so much more fun to write for someone else to enjoy! 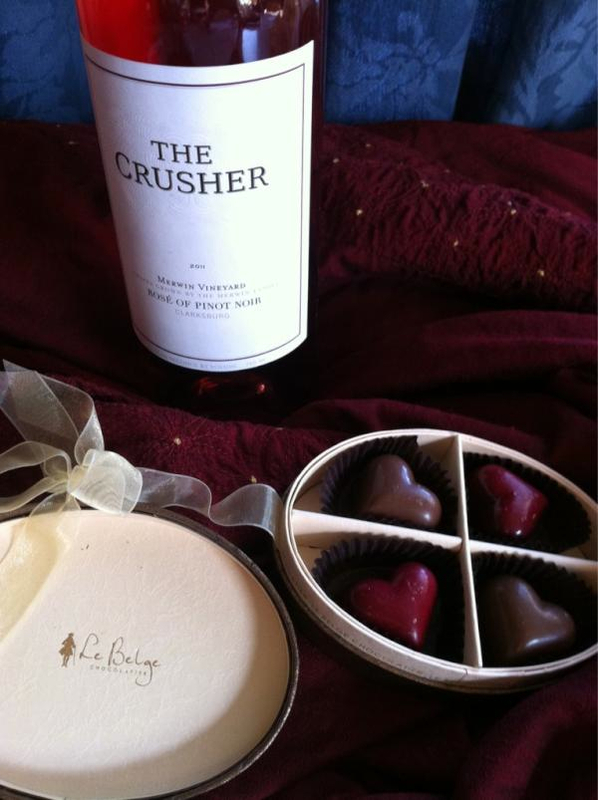 This Valentine’s Day, I was surprised to receive a gorgeous pink bottle of The Crusher Rose of Pinot Noir, a box of beautiful heart shaped LeBelge Truffles, and a letter of appreciation from Michael Wangbickler of Balzac Communications. Balzac often sends me wine samples (including The Crusher line-up last spring for a twitter tasting). This past November, Michael invited me to be on a panel with him and The Crusher winemaker to discuss wine and food pairing at the International Wine Bloggers Conference, an activity I really enjoyed. So a big thank you to Balzac Communications and to Mike! So–What are YOU drinking for Valentine’s Day? Great Review! I recently tried their Cabernet Sauvignon and thought it was pretty good. The one I tried was the 2010. Looking forward to giving the Rose of Pinot Noir a try. Cheers!